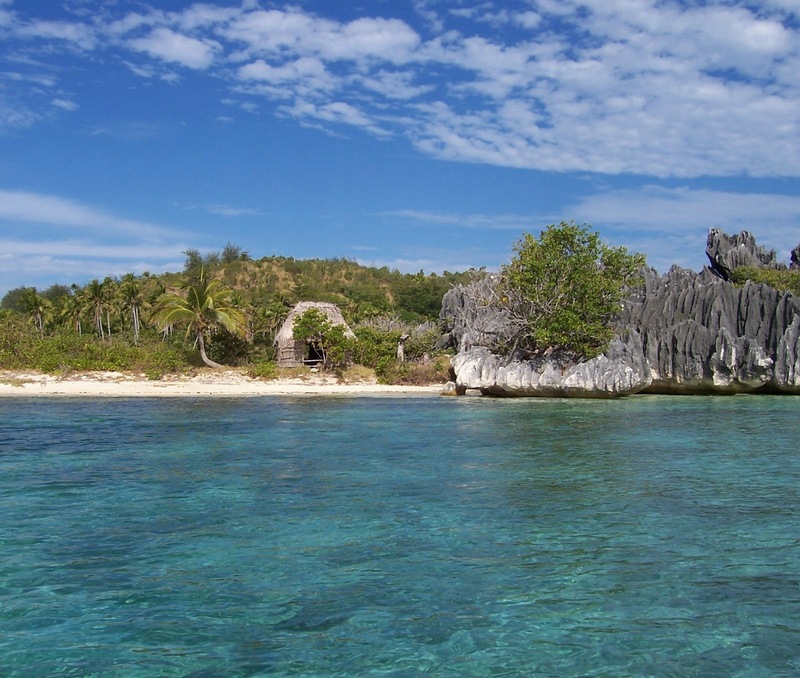 Crazy Travel Adventures: Fiji: The Blue Lagoon? Check! So far, I've kept to the alphabetical plan you can see in my first post. Here, we arrive at "F." My prior posts bring you Amsterdam, Africa, Belgium, Costa Rica, Dublin, and Egypt. 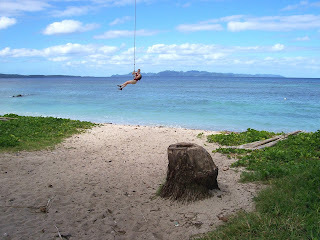 I packed an incredible amount into my 13 days in Fiji in 2004. I went to Taveuni Island (the garden island) to do the highly recommended Lavena Coastal Walk, took a short cruise in the Yasawa Islands to see the blue lagoon, and spent two days at Heaven's Edge in the highlands of Viti Levu. On Taveuni, my bure (burr-ay) was bigger than my apartment at the time. I had an indoor and outdoor shower. Hornets kept me company on my hammock with ocean view. A coconut fell right next to me. Of course, there is a sign! The Lavena walk follows the coast and then veers inland along a river ending at a waterfall. After the fantasy island stay on Taveuni (oh, um...except for giardia from a freshwater source - hint - look left), I was swiftly brought back to reality. Golden arches greeted me even in Nadi (Nan-dee), Fiji. The Yasawa Island cruise with Captain Cook Cruises came next. (http://www.captaincook.com.fj/yasawa-island-cruises/default.htm) What's better than cruising on the water when the height of giardia symptoms hit? This cruise claims to take you to where The Blue Lagoon was filmed! (I had the biggest crush on Christopher Atkins.) Seems the hut in the photo was Brooke Shields' dressing room. Hmmm. To me, the limestone formation seems to be floating above the water. What do you think? There is my cruise ship resting atop the beautiful waters of Fiji. We stopped at an island for a village tour and dinner and a show. After the cruise, I headed to Heaven's Edge in the mountains. I was their only guest at that time. This property in the highlands is set literally on an edge overlooking the Fijian valleys below. The nice staff welcomed me with a traditional Fijian kava ceremony. The effects of ingestion are calming and not supposed to cause a hangover. My bure is the one to the right. What a view! I watched the sun rise to the song of birds. The acoustics were phenomenal. I really thought a bird singing or flapping a wing was right near my ear. A 50 second sunrise video is at the end of this entry. What do you think of waking up to Fiji's natural music? The generator went off at 10p. I used my lantern for middle of the night exercise - there were 43 steps between me and the facilities On a jeep ride I saw wild horses, goats and other wildlife. Except for taking giardia along for a free ride, I enjoyed myself. I took this trip solo. Most people I met were honeymooners or getting married. They welcomed my company. I am still friends with one of the honeymooning couples. Wow, Debra, these are beautiful pictures. What fun: a hammock, an outdoor shower, an ocean view and wild horses! Great information...one of the best travelogues I've seen. I just recommended it on my Facebook page.